The trees of Acadia National Park, Mount Desert Island, Maine, are essentially northern in character, as the region belongs to the so-called Spruce and Northern Hardwoods division. Spruces are dominant, the red spruce making up a considerable portion of the coniferous stand over much of the island and the white spruce replacing it as the most abundant species along a large portion of the ocean front. Other trees which make up an appreciable amount of the total stand include white pine, red pine, white birch, gray birch, arbor vitae, balsam fir, red maple, red oak, hemlock, and aspen. Thoreau, with characteristic fitting and poetic phraseology, called this the "arrowy Maine forest." Four species of pines are native to the region and of these the white pine (Pinus strobus), emblem of Maine, the Pine Tree State, is most abundant. This, the noblest of our trees, has been known to exceed 4 feet in diameter and 150 feet in height, and has long been regarded as the most valuable timber tree in northeastern America. Its soft bluish-green needles are arranged in clusters of 5, the lateral branches are whorled, and the cones, usually measuring from 5 to 8 inches in length, are larger than those of any other native coniferous tree in the northeastern states. The red pine Pinus resinosa, whose needles 4 to 6 inches in length, are longer than those of any other of our needle-bearing trees, is tall and straight, with a pyramidal crown, dark green foliage, and reddish-brown bark. This bark, like the bark of the yellow pine of the west, tends to break up into broad reddish plates. The needles are arranged in bundles of 2. The symmetrical cones are somewhat spherical and about 2 inches long. It is valued highly as a timber tree and often goes by the name of "Norway pine." The pitch pine (Pinus rigida), very picturesque in its exposed rocky habitats, is usually low-growing and has an irregular scraggly crown. Its ovate cones may persist on the gnarled branches for many years. 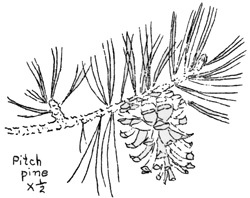 This is the only native pine of Mount Desert Island whose needles are arranged in clusters of 3. A boreal species, the gray, jack, or Labrador pine (Pinus banksiana), finds its southern coastal limit on Mount Desert Island. It is rare here, being represented by a small stand of trees to the south of Cadillac Mountain. On a portion of the Acadia National Park area which is located just across the by on Schoodic Peninsula, this pine is an abundant species. For the most part it grows considerably dwarfed and shrubby, and its small, tough, asymmetrical cones persist on the tree for many years. 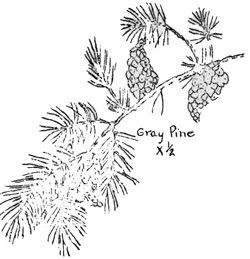 Its very short gray-green needles are arranged in clusters of 2. The larch, also known as tamarack and hackmatack (Larix laricina), is a common tree of the sphagnum bogs of the island. Unlike all other of our coniferous species, it sheds all its needles every fall, putting on new ones the following spring. These needles are borne on dwarf spur-like side branches. As it resembles a symmetrical pine in general form, the tree has a striking resemblance to a dead conifer in winter. It is a medium-sized, light-loving tree with a straight trunk, very small ovoid cones, and short clustered needles. The range of the larch extends across the continent, and it is found in the north within the Arctic Circle. Three spruces are native to Acadia National Park. The black spruce, also known as swamp spruce (Picea mariana), is a tree characteristic of our sphagnum bogs, although it is not infrequently found in a more or less stunted condition on dry mountain slopes where it may appear ragged and uneven in its habit of growth. Usually it is smaller than the other native spruces and the scales on its ripened cones tend to be stiff, rigid, and ragged-toothed. It bears needles which are dull and blunt. The red spruce (Picea rubra) is one of the most abundant of our trees. It has narrow conical crown and a straight slightly tapering trunk which usually attains a height of 60-80 feet. The branches are slender, the cones ovoid, and the needles a shining dark green or yellowish-green about one-half inch long. 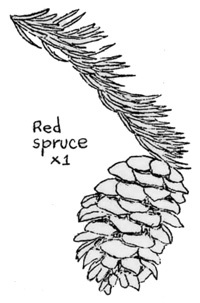 Whereas the other spruces have needles which are blunt at the ends, the needles of the red spruce are sharp-pointed. Next to the white pine, this is the most valuable timber tree in Maine. The white spruce (Picea glauca), a tall handsome tree especially valuable for paper pulp, grows best right along the ocean front of Mount Desert Island. Its branches, long and stout, bear dense attractive grayish or bluish-green needles which sometimes are characterized by an odor which accounts for the local name of "skunk spruce" or "cat spruce." As in all spruces, the oblong cones are pendant, and when ripe, the cone scales are flexible and not toothed. Although in cool moist ravines the hemlock (Tsuga canadensis) grows as far south as Alabama, it attains its greatest size and beauty in the Acadian region. In its preferred habitat it is a fairly common tree on Mount Desert Island where old specimens up to four feet in diameter are to be found. Its short flat needles are glossy dark green above and pale green beneath, there being a white line an either side of the midrib on the under surface. 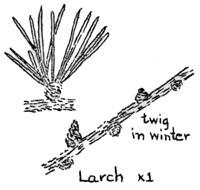 Although appearing two-ranked, the needles are spirally arranged around the twigs. The cones, oblong in shape, are about three-fourths of an inch in length - considerably smaller than the fruits of other conifers with which the hemlock is sometimes confused. Where goodly stands of this graceful and symmetrical tree grow, the summer visitor finds himself in the haunt of the winter wren, one of the finest of our feathered songsters and the veritable spirit of the cool hemlock forest. 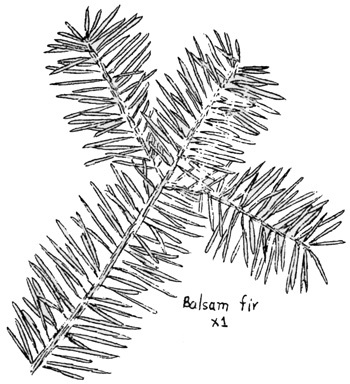 The balsam fir (Abies balsamea), the only fir native to Maine and the other New England states, is a common conifer in Acadia National Park. It is a tree of medium size, usually under 40 feet in height, and the trunk rarely exceeds 18 inches in diameter. Its bark, smooth and grayish-brown in color, is covered with projecting blisters which yield the pungently aromatic Canada balsam of commerce. The fragrant needles are arranged so that they give the twigs a flattened appearance. The dark purple cones, usually two or three inches long, are cylindrical and stand upright on the branches - a characteristic which distinguishes the fir from other conifers with which it may grow. 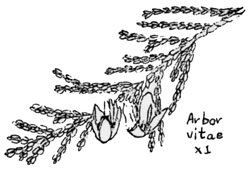 The arbor vitae, often known as white cedar (Thuja occidentalis), is a medium-sized tree which has its best development in swamps and bogs where it may be found in pure stands. Its trunk is tapering and the bark, often used by the red squirrel for the spherical nests which that animal builds, separates into long thin strips. The scale-like overlapping leaves, aromatic when crushed, are arranged to make a flat frond-like spray on which the small oblong cones are borne. The dwarf juniper, creeping juniper, and American yew, sometimes confused with the young of some of the trees already mentioned, are low-growing evergreen shrubs with needlelike leaves. They are common in some portions of the park and are readily distinguished in that they do not bear cones. Their fruits are small and berry-like, those of the junipers being blue covered with a pale bloom while those of the yew are a bright scarlet in color. Note: Articles on the deciduous tree of Acadia National Park will appear in future issues of "Nature Notes from Acadia."